Hello folks, hope you had a wonderful day today. E-Commerce is just another big common thing in India from Startup companies to Big Companies, Banks to ID Card Services, etc. Not to forget that India is a big country not only on Paper but in real life too. There are always many people wondering what courier services I should be taking for sending my stuff. Everyone wants speed and accuracy. People think twice before opting for Courier Services as it can give bad reputation about their company/E-commerce site due to if shipments are delayed, cancel or even bad responses like Incorrect Address, Landmark Required, and so on. 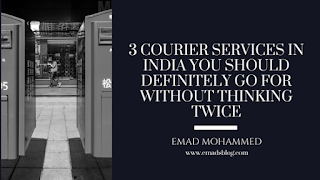 Here are the top courier services in India. It is one of the leading Courier services partners in India. According to me, the good thing about BlueDart is the Speed and their customer service. It is fabulous. I had many of the Parcels sent & delivered via BlueDart, and trust me once they picked it up then you don’t need to worry about anything. as they will take care of everything from there onwards. In case of delivery, they are the fastest one. I got my shipments delivered to me from many cities in India within a time frame of just 1-2 days and trust me not more than that in any case of shipment. The other reason is their offices are available everywhere in the cities of India. If the address goes incorrect or invalid phone, just go to their office and share AWB No. with them and they hand over the packet to you. As simple as that. The name itself tells you where it is based. A digital way towards commerce. It does all kind of commerce stuff like B2B, Express Distribution & Supply Chains. They deliver wide enough to cover almost all cities, villages in India. In 2017, their stats say they deliver to 1200+ cities and has over 3000 clients. They deliver a whopping 3,50,000 products in a day. Their service should never be underestimated. They offer COD and other multiple delivery options as well. They serve to over 13000+ pin codes. To be honest, they deliver it fast enough. There are no such cases where delivery is delayed by more than 4 days. They usually deliver within 3 days to be precise. They have reasonable price and international shipping too. Check them out now! Who doesn’t know it? It’s one of the badass International Courier services. The reason they are third on the list is that because of the high prices they offer. Also, they tend to not deliver many pin codes in India. They are the fastest and no doubt that they also have freights and aeroplanes delivering the parcels around the world. If you own the Business E-Commerce site and sell internationally then FedEx might be helpful in sending the parcel abroad. Check them out and find out the transit time and prices right away at their website. That’s it for today. 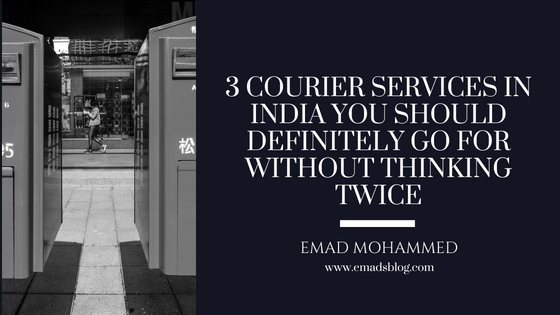 Hope you like the article and most importantly made your decision when it comes to Couriers. Share it with your friends and let them know too.